United States authorities recently discovered a drug tunnel stretching from Mexico to an old KFC in Arizona. 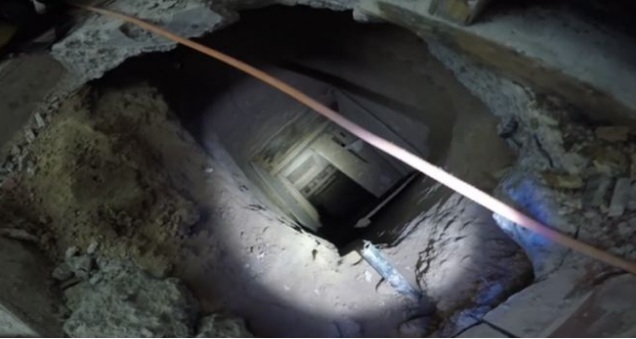 The tunnel measured 180 meters in length and it connected the basement of a house which was formerly a KFC business to someone’s bedroom in Mexico. This tunnel was used by drug peddlers to by-pass border checks on entering the USA. The owner of the house in South Arizona was arrested by the police after the discovery was made. KYMA News reported that the tunnel was discovered after a suspect, Ivan Lopez, was pulled over by the police. Ivan Lopez was transporting in his vehicle narcotics valued at USD$1 million and police dogs helped in identifying the drug trafficker. According to reports from investigators, Lopez’s vehicle was carrying 118 kilos of methamphetamine, 21 kilograms of heroin, 6 grams of cocaine and 3 kg of fentanyl. Police conducted a search in Lopez’s home and at his former KFC premises and discovered the tunnel’s opening at the kitchen of the fast-food joint. The tunnel was reported to be 3 ft wide, 22 feet deep and 5 feet tall. The tunnel was traced all the way to Mexico where it ended with a trap door under a bed. This is not a unique finding because a couple of years ago, police in San Diego, Califormia discovered a 2,600 ft tunnel. At that time, this was one of the longest tunnels ever discovered and it was used for similar drug dealing operations.